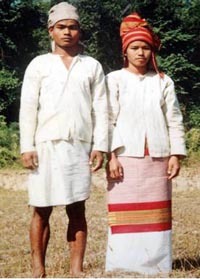 Ethnically Halam communities of Tripura belong to the Kuki-Chin tribes of Tibeto-Burmese ethnic group. Their language is also more or less similar to that of Tibeto-Burman family. Halams are also known as Mila Kuki, though they are not at all Kukis in terms of language, culture and living style. Halams are divided into several sub-clans which is referred as “Barki-Halam”. Major sub-clans of Halams are (1) Koloi, (2) Korbong, (3) Kaipeng, (4) Bong, (5) Sakachep, (6)Thangachep, (7)Dab or Nabin (8)Bongcher (9) Molsom, (10) Rupini, (11) Rangkhowl,(12) Chorai, (13) Lankai, (14) Kaireng(Darlong) (15) Ranglong (16) Marchafang & (17) Saihmar. As per 2011 Census their total population is 57,210 and distributed throughout the State. Halams live in typical “Tong Ghar” specially made of bamboos and Changrass (thatch). Apart from plain land cultivation, they still practice Jhum cultivation and depand on both the activities, apart from other substitute works. A good number among them are in Government jobs. Koloi, Rupini, Molsom, Ranglong, Lankai have their colourful dances and also have specific dance related to Jhum culture. Hi-Hook dance of the Halams is the most popular among all. Rai Balmani Festival is now-a-days observed by Koloi clan of Halams with full of joy and community participation.